grilled whole-fish ‘Parrillada’ for lunch, and an evening entrée of beef tenderloin wrapped in bacon-charred onion petals and slathered in Los Fuegos' signature criolla sauce. In-house guests may dial the Concierge at 4037 for more information. Reservations can be made at +1 786 655 5600. Starting May 2019. In-house guests may dial the Concierge at 4037 for more information. Reservations can be made at +1 786 655 5600. NOCHES DE SON Balmy Wednesday nights were born for indulgent Havana-inspired cocktail hours under the stars at Faena’s Tree of Life. Embody island life at Faena Hotel's Tree of Life, where locals and guests mingle beneath the setting sun as the live quartet Ola 305 creates a sonic experience synthesizing tropical beats and Afro-Cuban funk. Sip on a classic Cuba Libre, a glass of Faena's smallbatch vino, or switch it up with inventive Bacardi libations like the citrusy Acere, a tantalizing combination of cherry liqueur, grapefruit and rum, or Dale, mixed with añejo rum, scotch, vermouth and violet liqueur. Cuba’s signature flavors come alive with complimentary light bites from the kitchen of famed grillmaster Francis Mallmann, and of course there are hand-rolled cubano cigars to make it a delightfully authentic affair. In-house guests may dial the Concierge at 4037 for more information. Cocktail hour every Wednesday at 5:00-8:00 pm. ners and under spotlights, taking the evening on unexpected twists and turns as heart-pounding tracks, uplifting vocals and electric violins command the crowd. Guests are highly encouraged to flex their creative muscles with theatrical regalia that lets their inner Pegasus take flight. explores the venge-seeking demons and pulsating rage that can come on the tailwinds of betrayal and true love. In a sinful, boundary-pushing retelling, the Alma Dance Company uses their flowing bodies and stirring movements to explore these human themes and unite the story’s passion with that of the breathless audience. April welcomes back some of our favorite live performers and DJs, including Sir Portela Ft. Paula Hernandez, Write Sounds Jazz, American Gipsy, Javier Garcia, Yamit and the Vinyl Blvd, Mi Dulce Son, The Usual Suspects Ft. Keba, Jahzel Dotel, The French Horn Collective, Los Wizzards, Louis Amanti, Gian Faraone, Mari Macedo Trio, DJs: Funky Therapy, Richie Hell, Mojody, Sire, Ella Romand, Sire, Giovanetti, Kora Noir, Diego Ciaramella, DiscoRocks, and Fabian Giannattasio, among many others. CASK: A SEDUCTIVE THEATRICAL TAKE ON AN AGE-OLD STORY A spine-tickling new performance steals the Sunday night stage at Faena Theater this month. Reservations at Saxony Bar are required, and strongly encouraged for The Living Room. In-house guests may dial the concierge at 4037 for reservations. a show-stopping performance they’ll never forget with live band Higher Ground backing your vocals. After the curtain falls, celebrate your shining moment at Saxony Bar’s Rock the Mic After Party. Faena Hotel Miami Beach made history in 2016 when it became the first independent hotel to achieve a Forbes Five-Star rating within its opening year. The hotel continues to build upon this success and is proud to announce it has maintained its elite five-star status for the third year in a row. Forbes Travel Guide's incognito inspectors travel the world, evaluating properties based upon 900 rigorous and objective standards from helpfulness of staff and housekeeping to topnotch food and beverage experiences. The company's annual star ratings help discerning travelers select the world's best luxury experiences. 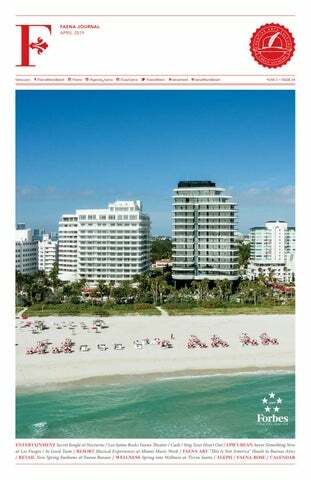 Readers of Conde Nast Traveler magazine have also named Faena Hotel Miami Beach as the number one hotel in Magic City for a second consecutive year, as well as a top 10 hotel in the United States, while editors at Travel + Leisure have once again placed the hotel on its highly regarded World’s Best Awards list. 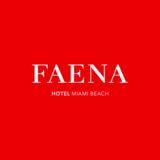 In 2017, AHEAD Awards named Faena as Hotel of the Year and best Resort Hotel; the list goes on. These accolades are a testament to Faena Hotel Miami Beach’s unwavering attention to the minutest of details, thoughtful service that consistently exceeds expectations, and beloved South American hospitality. FAENA EQUALS FAMILY FUN A new season is the perfect excuse for a fun-filled family vacation. At Faena, we know how to pamper guests of all ages. Parents can expect half-off rates on a second guest room, daily breakfast for up to three guests per room, and complimentary amenities like rollaway beds when booking our Faena for Families offer. The package also comes with complimentary half-day sessions for kids at Faena Play, where little ones spend hours going on adventurous scavenger hunts, flying kites and playing soccer on the beach; all the while, you sit poolside sipping a freshly-muddled cocktail or indulge in a restorative massage. In the evening, book a babysitter and treat yourselves to romantic child-free dinner, drinks and dancing in The Living Room, or a sultry night at the velvet-lined Faena Theater for its latest scintillating show, Samsara Cabaret. FROM OUR CULTURAL PARTNER The Rhythm Foundation presents: Turkuaz Energetic splashes of funk, alternative, rock, R&B, and psychedelia color the music of Turkuaz. Balancing male-female harmonies, strutting guitars, wild horn arrangements, and interminable grooves, this spirit takes shape in the color donned by each respective member on stage nightly via larger-than-life performances. The Brooklyn-based nonet ignite an explosion of energy punctuated by neon hues, deft musicality, and show-stopping sing-alongs on their fifth full-length album, Life In The City. BY DR. ROBERTA DEL CAMPO TIERRA SANTA HEALING HOUSE WELLNESS COLLABORATOR With over 5 million cases diagnosed in the United States each year, skin cancer is the most common cancer in the United States. Fortunately, skin cancer is also one of the most preventable forms of cancer. With Skin Cancer Awareness Month right around the corner, let’s focus on the more common type of skin cancer, nonmelanoma skin cancer, which includes basal and squamous cell carcinomas. These skin cancers are typically localized to the skin with little risk of metastases. Below are some additional facts and statistics to know about. • More people are diagnosed with skin cancer each year in the U.S. than all other cancers combined. • One in five Americans will develop skin cancer by the age of 70. • The diagnosis and treatment of nonmelanoma skin cancers in the U.S. increased by 77 percent between 1994 and 2014. • About 90 percent of nonmelanoma skin cancers are associated with exposure to ultraviolet (UV) radiation from the sun. • Basal cell carcinoma (BCC) is the most common form of skin cancer. An estimated 4.3 million cases of BCC are diagnosed in the U.S. each year, resulting in more than 3,000 deaths. • Squamous cell carcinoma (SCC) is the second most common form of skin cancer. More than 1 million cases of SCC are diagnosed in the U.S. each year, resulting in more than 15,000 deaths. • Regular daily use of an SPF 15 or higher sunscreen reduces the risk of developing squamous cell carcinoma by about 40 percent. • The Skin Cancer Foundation recommends that everyone practice monthly head-to-toe self-examination of their skin, so that they can find any new or changing lesions that might be cancerous or precancerous. Skin cancers found and removed early are almost always curable. • A baseline skin exam followed by repeat annual exams (more frequent if diagnosed with a skin cancer) by a board-certified dermatologist. To book a consultation with Dr. Del Campo, please email spamiami@faena. com or call 786 655 5570. In-house guests may dial Tierra Santa at 3217 for more information. “This Is Not America” Heads to Buenos Aires The Faena Festival, which explores the different narratives and mythologies associated with America, will debut across the city of Buenos Aires this April 8 to 14, in collaboration with the Semana del Arte and ArteBA, one of the largest contemporary art fairs in Latin America. The first edition of the festival explores Buenos Aires’ influential role as a port city that has long received immigrants, refugees and travelers. ‘This Is Not America’ addresses the continent of America as a concept more than a place, a powerful idea that is greater than the waters and borders that frame it, says Zoe Lukov, curator for Faena Art. It will feature site-specific 1.
commissions, large-scale installations and stunning performances across a range of artistic genres from artists like Cecilia Bengolea, Alfredo Jaar, Isabel Lewis, Luna Paiva and Fernando Rubio, as well as film and video work from Joseph Beuys, Ana Teresa Fernández and Boris Mitic. “Culture is our most precious capital,” Jaar affirms. Faena Festival Buenos Aires Edition Various Venues 2. On April 7, coinciding with the global celebration of World Health Day, an inspired group of renowned practioners are coming together to lead guests on a day-long journey: “How to Live Happily and Healthily.” Expect Ananda yoga, a blissful asana ﬂow guided by Ruslan Kleytman, along with mantra music, Vedic wisdom and devotional poetry. He’ll then guide participants through a yoga nidra sequence and sound bath designed to open participants up to a higher frequency of loving-kindness resonance by uniting science and spirt through the power of sound. We all know that true health starts with what you put into your body, and Bryan Huberty and his Live Ultimate team will teach guests how to heal their bodies using food during a delicious degustation of organic products and vegan snacks. The experience culminates with Pranic Healing led by Spa Director Agustina Caminos and a closing ceremony held by Caminos and Kunal Chohan. On April 9 and 10, guests can tap into their inner mystic with Tarot readings from Derek Seagrief; and on April 21, Caminos will guide guests on a special Easter Sunday Twin Hearts Meditation that will open them up to selfless service and joy. Tierra Santa closes out a vibrant month of healing workshops, yoga experiences and shamanic rituals with a Cushion Crawl Mantras and Meditation session this April 28, led by Caminos and Daniela Arhat. 1. & 3. Cecilia Bengolea's performance. 2. Alfredo Jaar's 'This Is Not America'. 4. & 5. Isabel Lewis' performance. For more information about Faena Rose, contact rosemembership@faena.com Follow @Faena.Rose on Instagram for more highlights, happenings, and everything in between. A short story writer and admirer of the fantastic genre: two qualities for which Borges is the ideal person to guide us through such territory. to some of the works that formed part of The Library of Babel, a collection dedicated exclusively to fantastic literature and, in particularly, short stories within that genre. The combination could not be more appropriate: Borges choosing fantastic stories for someone else to read and, in the collection we find, among others: “The Concentric Deaths” by Jack London “The Mirror that Fled” by Giovanni Papini “The Guest of the Last Parties” by Villiers de L'Isle-Adam “The Door in the Wall” by H. G. Wells “The Shining Pyramid” by Arthur Machen “The Eye of Apollo” by G. K. Chesterton “The Statue of Salt” by Leopoldo Lugones “Micromégas” by Voltaire “Idle Days on the Yann” by Lord Dunsany In addition to the abovementioned collection, the prologues are collected in Prologues to the Library of Babel, a list that, as Roberto Calasso said of the bibliography of Crowds and Power by Elias Canetti, is a kind of route map, an invitation to follow the path of somebody who has found in the short story one of he best vehicles for the awe that literature can inspire in us. with Bar Lab’s award-winning mixologists; a pre-release screening of Cannes-nominated documentary Be Natural: the Untold Story of Alice Guy-Blaché, followed a Q&A with filmmakers Pamela B. Green & Geralyn Dreyfous in collaboration with The Feminist Institute; and a conversation with Lava Records CEO & host of the Wrongful Conviction podcast, Jason Flom, about the Innocence Project, a non-profit that exonerates the wrongly convicted through DNA testing and reforms the criminal justice system to prevent future injustices. REV THOSE ENGINES —ALFA ROMEO AND FAENA ARE GETTING IN THE FAST LANE TOGETHER. Discover more about our all-new Alfa Romeo Thrill Ride program, exclusive to guests of Faena Hotel Miami Beach. To learn more, please visit the Concierge desk.